While I live within walking distance of three cupcakeries, I do spend a lot of time a few miles down the street at my boyfriend’s (aka “the teacher man”) place. His apartment straddles the Overland Park/Olathe, Kansas, line, so it’s not uncommon for me to sometimes hungrily roam about the Olathe strip malls in search of food. During one recent hunting and gathering session, I found Sugar Rush and was eager to see what the new shop had to offer. When I walked in, the perfectly frosted cupcakes greeted me. Each cupcake was labeled with an adorably handwritten nameplate, and I was impressed by how many flavor options were available. I chatted with the girl behind the counter and chose four cupcakes to take home and share with the teacher man. Because I’m a die-hard chocoholic, I couldn’t resist trying the Sugar Rush’s triple chocolate cupcake. Rich chocolate cake and milk chocolate frosting topped with chocolate chips made for a triple threat to my taste buds…and boy did my taste buds like it! This cupcake rocked. 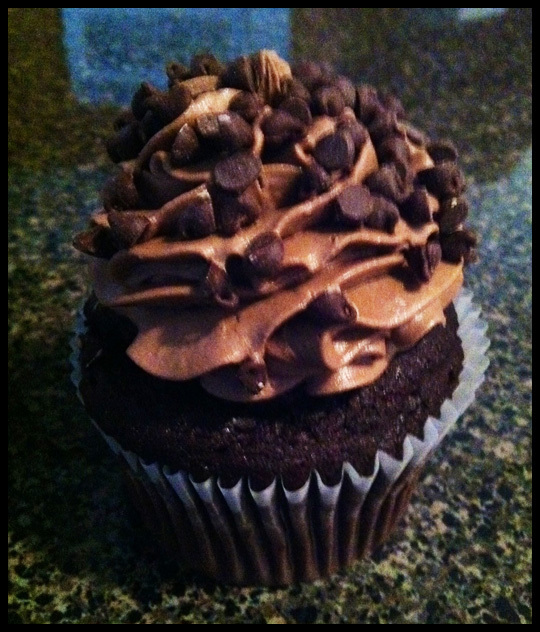 If you’re a chocolate lover, get this cupcake! It’s not overpowering — the different layers of chocolate, from the luscious dark chocolate cake to the smooth, milky chocolate frosting and bits of chocolate chips, give your mouth different flavor sensations instead of chocolate overload. Just make sure you have a tall glass of milk to wash it down. In between sips of milk (you know, to cleanse the palate), I tested the other cupcakes. I alternated between chocolate-heavy and other cupcakes (yes, in my world, there is “chocolate” and “other” flavors!) so I could fairly judge the chocolates and not go into sugar shock. To balance out the decadence of the triple chocolate, I moved on to the snickerdoodle cupcake, the perfect balance of cinnamon and sugar. As you can see, this snickerdoodle cupcake is loaded with frosting — which is a bonus to me — but what I think even non-frosting fanatics could like about this cupcake is that the icing is faintly flavored. Yes, the cinnamon and sugar shine through, but it’s not so sickly sweet that you just can’t eat it. It’s a perfect match to the moist, flavorful cinnamon cake and, just to be honest, I’d like to have this for breakfast as often as possible! If cupcakes for breakfast just aren’t an option (fine! ), then how about a cupcake inspired by one of my favorite snacks? I had to get a peanut butter cup cupcake from Sugar Rush because peanut butter and chocolate goes together way better than peanut butter and jelly. 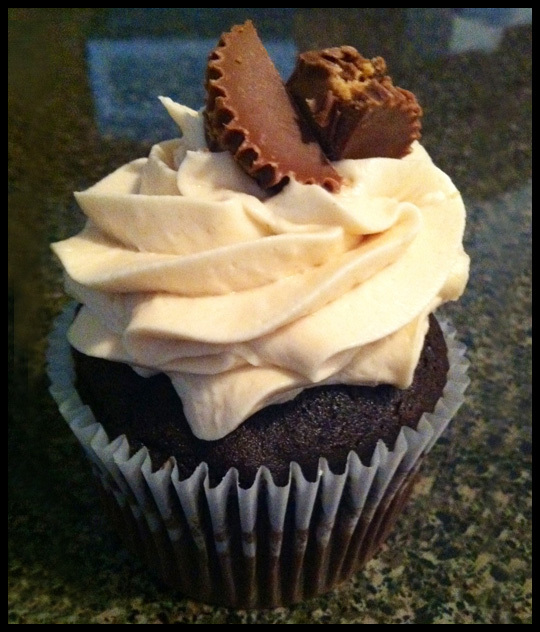 Chocolate cake, whipped peanut butter frosting and a Reese’s on top made this cupcake heavenly. The cake was perfect like the triple chocolate’s. 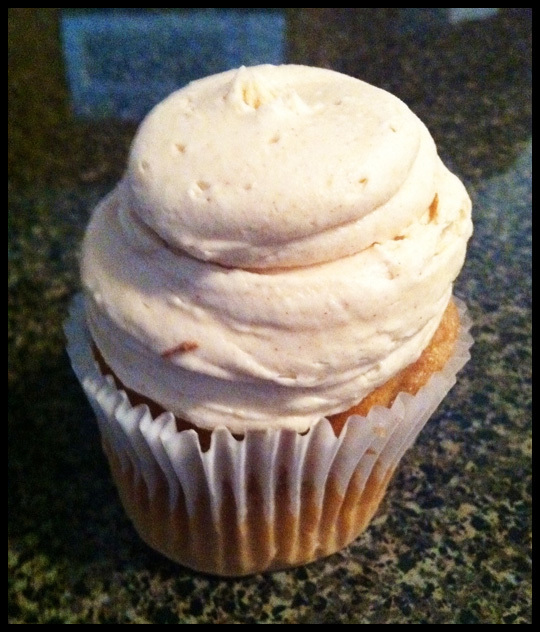 I liked the fluffy consistency of this frosting — how’d they get peanut butter to seem so airy instead of sticky? If you’re a pb&c kind of gal or gent, get this cupcake. So with three spot-on reviews so far, and no criticism about the cake or frosting, why is Sugar Rush at No. 3 on the list? The girl behind the counter told me that the carrot cake cupcake were great and also lasted a little longer than the other cupcakes (I was taste-testing over the weekend and worried that I’d need to save a cupcake to taste for later, which I didn’t), so I decided to try it. 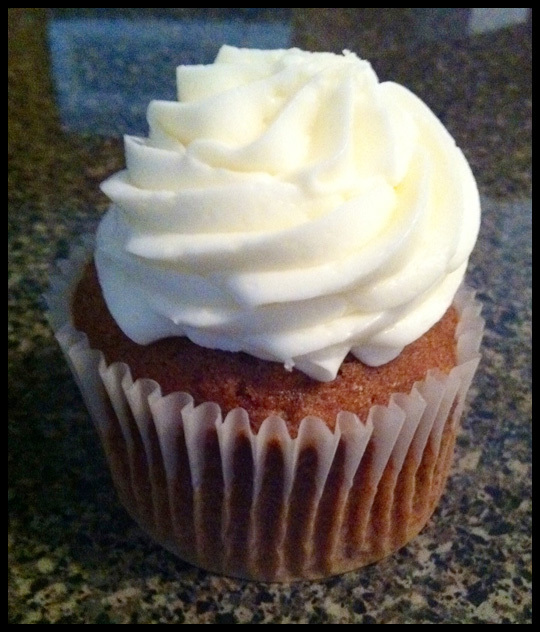 When I first dove in to the carrot cake cupcake, I was pleasantly surprised by the smooth cream cheese frosting and light carrot flavor. But, something was off about the cake. Most carrot cakes I’ve had have never had an issue with dryness — and Sugar Rush even said that the carrot cake cupcakes typically last longer — so this just didn’t add up to me. I had a few more bites of cake only, and even throughout the middle of the cake, it was just not as moist as it could have been. While there is obviously room for improvement here that could eventually catapult Sugar Rush to the top, I think that the one common thread between my No. 2 and No. 1 picks (coming in the next two weeks) is that they are both consistently delicious in all their flavors. 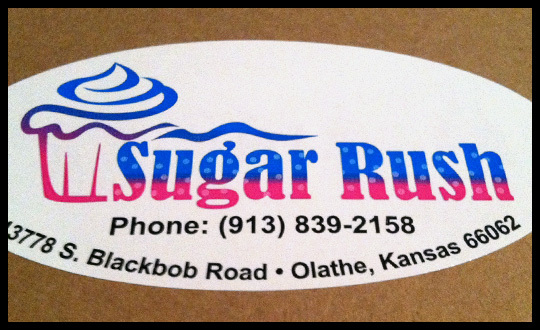 Sugar Rush is new, small and family-run, so I think it’s a great accomplishment to begin turning heads so quickly in the competitive KC cupcake business. I’ll definitely be back to get another sampling of the 20-something flavors offered…and yes, I’ll take another test run with the carrot cake. What classic cupcakes do you always expect consistency from? 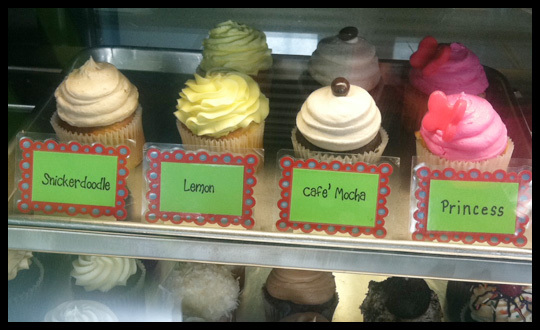 What makes or breaks it to you when it comes to choosing your favorite cupcakeries? Tell me what you think in the comments section. This entry was posted in Cupcakes, Kansas City and tagged best cupcakes in kansas city, best cupcakes in olathe, Cupcake, kansas city cupcakes, kansas city suburbs cupcakes, kimberlyloc cupcake reviews, kimberlyloc cupcakes, olathe kansas cupcakes, sugar rush, sugar rush carrot cake cupcake, sugar rush cupcakes, sugar rush cupcakes olathe kansas, sugar rush peanut butter cup cupcake, sugar rush snickerdoodle cupcake, sugar rush triple chocolate cupcake by Stacy. Bookmark the permalink. That’s too bad about the carrot cake, it’s one of my favorites so that would be a huge let down to me. I hope your next tasting of it goes better! Their cupcakes are so beautiful and that chocolate has me needing a chocolate fix…like right now. Stacy and I have talked about chocolate cake/cupcakes and both agree that if you are going to do chocolate, it needs to be decadent and so far it seems like the places in your top 5 do just that!